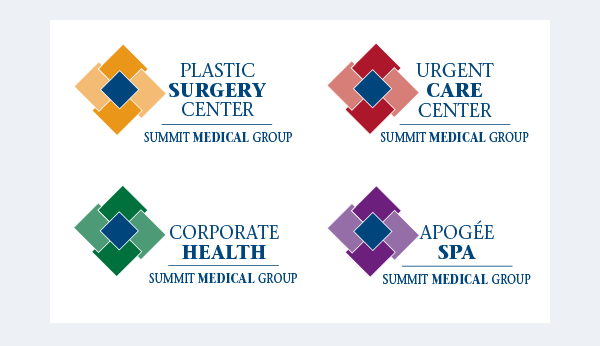 Summit Medical Group is a multi-specialty medical facility. The interlocking diamonds represent the segments of the practice working in tandem to provide the patient with the most comprehensive healthcare services. In addition to medical doctors, nurses, and staff, the Group provides outpatient testing and diagnostic services, urgent care and behavioral health services amongst others. The sub-brand logos were created for particular divisions of the practice that were to be marketed independently such as Urgent Care and Plastic Surgery. As Summit Medical Group grew rapidly, the general approach changed. 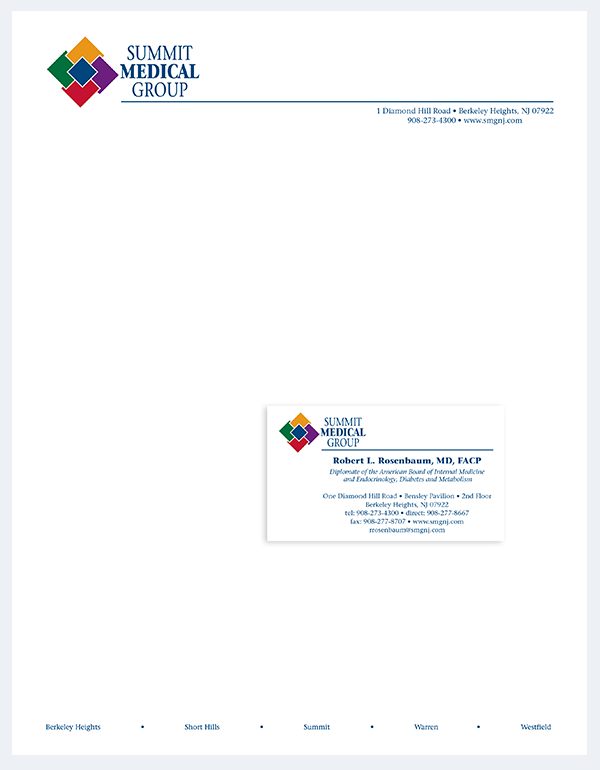 All of the new practices were given a transitional logo for a year with their name and Summit Medical Group in order to integrate doctors and patients to the practice. With the addition of new practices outside of New Jersey, we needed to create new branding for Oregon and Arizona. There are horizontal versions of the original SMG logo so we were able to create both vertical and horizontal versions for the new practices. Winner of the 26th Annual Healthcare Advertising Awards branding program.